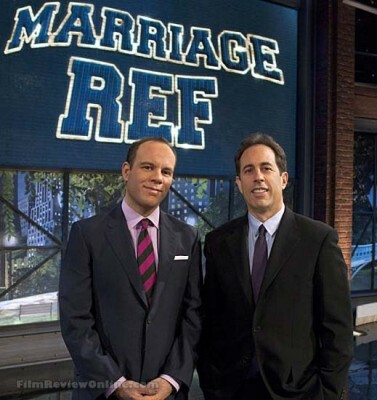 This reality TV series is conceived by comedians Jerry Seinfeld and Tom Papa. Seinfeld stays mostly in the background as an executive producer, save for an occasional stint on the panel, and Papa acts as host and referee to the show’s guests, the fighting couples. Seinfeld, who once put out a “show about nothing,” aims for this series to be “a comedy about situations in reality,” and while the first series was about the single life, this one is about marriage. Each episode, Papa and a panel of three celebrities view clips of married couples who are fighting over something relatively minor, such as grooming habits, pets, house decor, hygiene habits, cooking responsibilities, and even Mariah Carey. The couple is viewed in their own home fighting and is usually presented in a humorous manner. After Papa and the celebrity panel view the clips, they discuss the pros and cons of the situation. They also get help from NBC News Correspondent Natalie Morales who appears as the fact checker, confirming truths and falsehoods about the couple and their situation. Each celebrity weighs in on who they side with, husband or wife, and Papa then makes his own decision, which may or may not coincide with that of the panel. The couple is then seen via satellite and told of the decision. At the end of each episode, the couples win trips to a romantic location. The celebrities that have appeared on the series include Alec Baldwin, Kelly Ripa, Jimmy Fallon, Sheryl Crow, Kirstie Alley, Tracy Morgan, Kathy Griffin, Nathan Lane, Cedric the Entertainer, Martha Stewart, Jason Alexander, Madonna, Ricky Gervais, and Larry David. First aired: August 14, 2011.